The WCW Bend-ems were originally produced in 1990. In 2003, some thirteen years after their release, a figure that nobody in the collecting world even knew existed has shown up out nowhere! 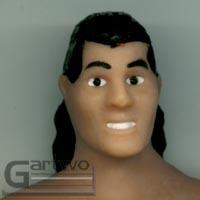 Yes, Ladies and Gentlemen there is an El Gigante WCW Bend-em! Apparently only released in Argentina (the home country of El Gigante) this is an almost unbelievable find. 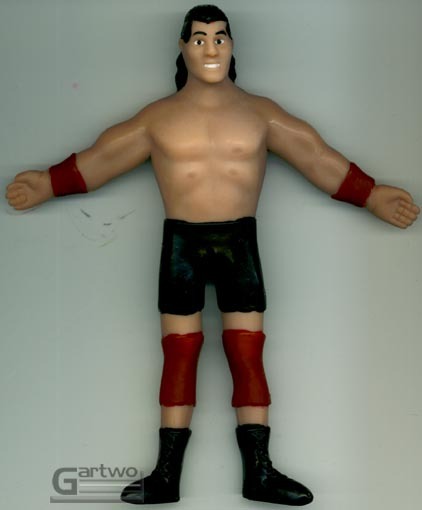 This figure was released by Play Well, the company that released the other 12 original WCW Bend-ems internationally on Spanish cards, but the trademark on the back of the figure reads 1990 Justoys. 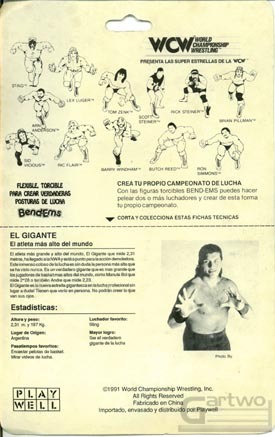 The packaging is just like that of the other figures, the back features illustrations of the 12 previously known wrestlers released and a bio-card of El Gigante. This figure stands a little bit taller than the others in the set. The material that he is molded from also is a little different in feel and color from the others. Aside from these facts, very little is known about this figure. How many were produced? Were they sold elsewhere in the world? And perhaps the most intriguing question that this new discovery raises: Are there any other WCW Bend-ems we don't know about yet? Just like finding out how many licks it takes to get to the center of a Tootsie-Pop, "The World may never know." 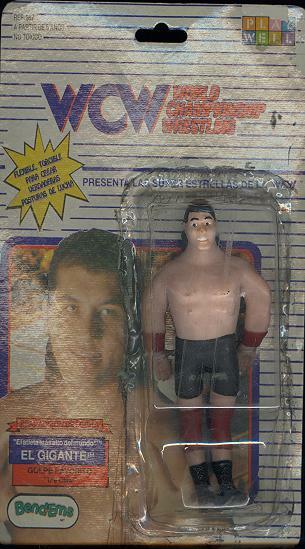 One thing I know for sure is that this is truly one of the rarest wrestling figures known, and probably the rarest bendie ever! Thanks to the guys at Rocket's Wrestling Figures and Stomwijf.com for information & additional pictures. And a HUGE thanks to Roberto at the Bueno Aires Toy Museum for amazingly helping me track down one of these figures for my very own! 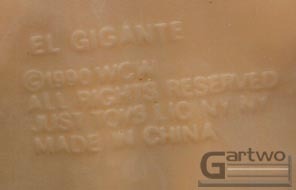 More pics of the rare El Gigante!